On this page, I’ve listed some resources you may need. The sub-pages list some referral partners who may be useful to you. Please let them know that you got their information from my website if/when you contact them. 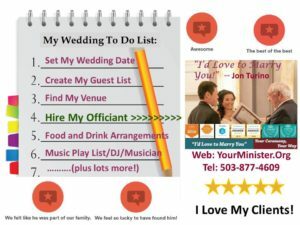 Please note: This page and its sub-pages are, and will continue to be, works in progress as I add more trusted colleagues who can help you have a perfect wedding day. 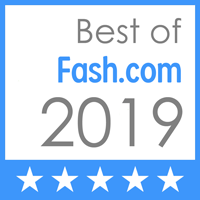 So please forgive any formatting issues and please feel free to recommend someone with whom you have had a 5-star experience so that I can contact them. Everything on these pages is in alphabetical order. Make sure that you get your marriage license at least three (3) full days in advance! You can get the waiting period waived in some counties in Oregon for an extra fee but that’s not the case in Washington! See my blog post for more information on this. FYI, your marriage license must be issued by a County in the State in which the ceremony will be performed. Hover over the “Referrals & Resources” tab above for a large selection of vendors you may need ranging from Attire to Videography. 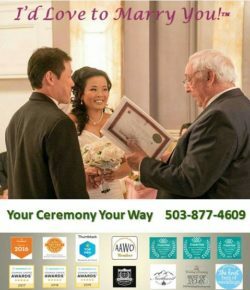 Are you looking for a Wedding Officiant or Wedding Minister in the Portland Oregon region? I also perform wedding ceremonies in Vancouver, Washington, and environs! Want to be listed here one of these pages? Have someone recommend you. Or if you have a similar page where you can list my website, send me a link showing my listing on it and I will most likely reciprocate by adding your listing to this page.